This ground-floor studio opens directly onto the lawn with 20 steps to the ocean. You can listen to the waves and watch the palm trees sway while lying in bed or sipping Mai Tais on the lanai. There's a king-sized bed and queen sofabed. 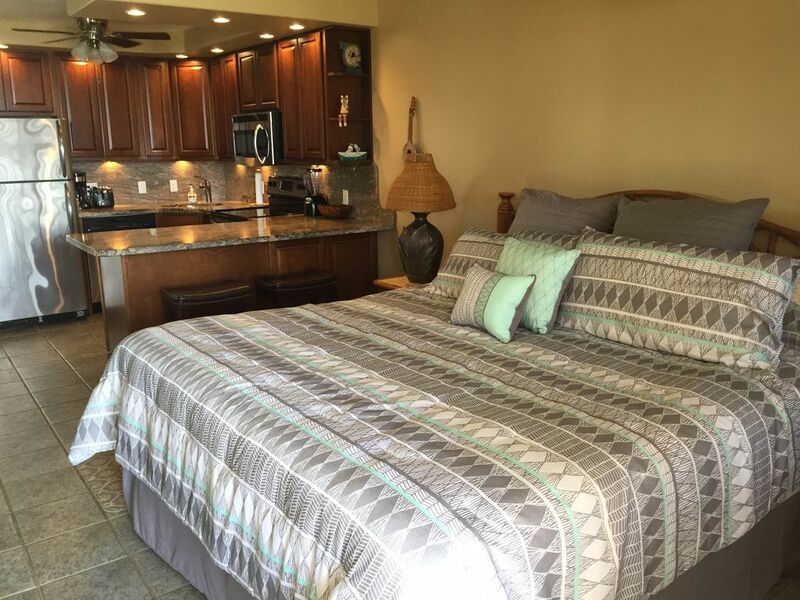 Tile throughout, fully equipped kitchen with granite countertops and stainless steel appliances, view to the west of sunsets, Molokai and whales (November to April) or spinning dolphins and sea turtles the rest of the year. The beach in front of the Valley Isle comes and goes with the seasons. The winter swells pull the sand away but by spring and summer, the sand returns. All beaches on Maui are public and every beach is different. Some are good for body surfing (Makena), some are good for rolling around in the sand (Black Rock) and some are better for snorkeling (Fleming, Kapalua). So when you arrive, if our beach is looking a bit sad, hop in the car and do some exploring. You might even find Secret Beach. We do not charge a cleaning fee, and parking and wifi are free. The owner photo is a picture of my Mom and Dad at sunset in front of the Valley Isle. They bought their first condo at the Valley Isle in 1975 and later bought Studio 106 so that there was more room for family to visit at the same time. For 40+ years, our family has made the Valley Isle our second home. Mom and Dad always went out to the beach at sunset to blow the conchs and enjoy cocktail hour with friends old and new. I am their daughter and have taken over renting the condos. I live in Portland, Oregon, and enjoy gardening, splitting wood and raising chickens. Many years ago, the owners and residents began a tradition of gathering on the beach at sunset to blow the conchs and "talk story". It may not happen every evening (Sundays are your best bet) but you may get a chance to blow a conch and make new friends. If you were any closer to the ocean, you'd be in it! We have experienced recent shoreline erosion and the beach directly in front of the building is now seasonal. There is still a sandy beach just to the south. Oceanfront lanai offers spectacular ocean and island views. Help yourselves to the herb garden next to the gas grills to add a sprig of rosemary, basil or thyme to whatever you may be grilling. Great location, clean and spacious for a studio. This is a resort so is close to many areas in Lahaina. Downside is the no A/C and this time of year (early april) there is barely a beach within walking distance due to the eroding of the waves. The wall in the pictures are sandbags. Overall was a good stay though. Wonderful views just a step away! Nice and clean condo, has everything you need! The condo was cozy, and the bed was comfortable. The kitchen has all you need to cook, also there are nice clean grills to use by the pool. Great views right out the front patio door. While there is no air conditioner, it wasn't needed as you get great airflow when both doors are open. If you need internet service it worked great while we were there. I don't know where you do your laundry at as there is none in the condo and thought there was to be some, if we had stayed more than a week I would have looked harder to find it. My suggestions would be to get more comfortable stools to sit at the counter (maybe some with backs) and to fix the locks on the patio door and the main door screen door (very hard to lock and then reopen). We used the coolers and lawn chairs in the closet but the boogie boards were not in very good shape so we rented from Boss Frogs across the street. We ate at Miso Phat one night, very good sushi! Maui Brewing Company is just a short walk away, food was ok, beer was better! We would definitely stay here again! The condo was absolutely perfect for my daughter and I to have a relaxing vacation for Thanksgiving break. We knew we wouldn't be spending much time inside, and primarily wanted a place right on the beach. We couldn't have asked for a better location. Communication from Kathryn was great; we had no questions when we arrived at the condo. She also had some good suggestions on where to go for snorkeling. The place had everything we needed, even though AC would have been a nice addition. But just opening the lanai door in the evening helped, and who can resist the sound of the waves crashing on the beach at night. I would most definitely recommend staying here if you are looking for a quiet place to stay and want to be on the beach. Literally, you are 20 steps from the beach (which we spent several of our afternoons just relaxing on until sunset). We will most definitely stay here again! We were so pleased when we found this amazing studio on VRBO. We booked it mainly for the lanai, but also because the interior looked so inviting - and it was. The King size bed was extremely comfortable and we felt safe enough to leave both front and back doors open all night and just use the screen doors so the breeze could come through. Awesome... The kitchen has obviously been recently remodeled and is well equipped. There's even a coffee grinder and a hairdryer in the bathroom. Hint: the wifi password is in a shirt-shaped frame behind the modem. If you're even thinking about booking this room - Do it! You won't be sorry. Absolutely loved everything about this condo. The only thing I wish we had in this unit was AC, but we got used to the heat by the second night. Kathryn has great communication and front desk was very helpful! Will definitely stay here again!